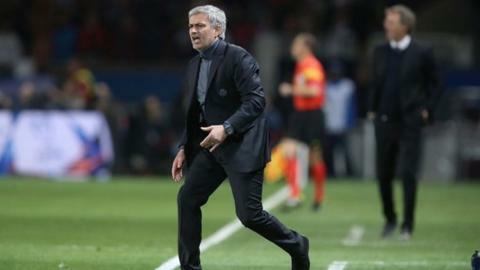 Chelsea boss Jose Mourinho criticised his side's "joke" defending and blamed his misfiring strikers after a 3-1 defeat by Paris St-Germain left their Champions League campaign in trouble. "The third was not a goal, it's a joke. Gary Cahill says 'sloppy'. I say 'ridiculous'," said the Portuguese. Mourinho fielded winger Andre Schurrle on his own up front, leaving £50m signing Fernando Torres on the bench. "I'm not happy with my strikers, I have to try things," said Mourinho. "With Andre, at least I know we have one more player to have the ball, we have one more player to associate with the other players. "Football is also about scoring goals. That is for strikers, for real strikers. I had to try." Torres has scored only nine goals in his 32 appearances this season, while Demba Ba, who was an unused substitute, has five in 22 appearances. Cameroon international Samuel Eto'o has been more prolific but has been out injured since the 6-0 win over Arsenal on 22 March. While Mourinho has regularly expressed his dissatisfaction with his forwards, his defenders, who had conceded just four goals in the Champions League this season before defeat in Paris, have been largely exempt from criticism. However, the Portuguese believes all three of PSG's goals could have been prevented. Ezequiel Lavezzi swept in an early half-volley to put the hosts ahead before Eden Hazard levelled from the spot after a foul on Oscar. David Luiz bundled into his own net to restore PSG's lead, then, after Edinson Cavani fired wide, Pastore's solo effort swung the tie the home side's way. "We played against a great team with fantastic attacking players and you would expect them to score fantastic goals, not the goals they scored," added Mourinho. "We assisted the striker for the first goal. For the second goal, the way the team was positioned defensively was not right. The third was ridiculous. "We made individual mistakes in areas where, for the whole season, the guys perform and we have no problems. "They have the right to make their mistakes, because we have other players that make mistakes the whole season."